Datamartist is a flexible, visual, data profiling and data transformation tool. It can read data from data sources (such as files, or relational databases), do data transformations using a simple, visual user interface, and then can write the results into files or databases. By combining a flexible ETL tool with data profiling capabilities, Datamartist is a fast and easy way to both do ad-hoc data profiling, and to set up automated data quality monitoring. For a wide range of data transformation requirements, Datamartist is the only tool required, giving a fast and flexible ETL capability to pull all sorts of data from all sorts of sources. How does the Datamartist trial work? The trial is easy. Just download the installer, install Datamartist on your machine and then run Datamartist. Datamartist will activate itself for 30 days. You will have all the functionality available, no limitations for 30 days, and you don't need to be connected to the internet to use the trial. The trail version can show either standard or professional functionality, and this can be changed on the fly, letting you understand fully the differences between the two editions. We're pretty sure that after your first try, you're going to see how powerful and useful Datamartist is. But in some cases, where companies want to try a proof of concept, to really kick the tires, we can arrange an extended trial. Contact us at sales@datamartist.com and we'd be happy to help you evaluate Datamartist fully. How much does Datamartist cost? Please refer to our product page to get the most up to date price, and the available editions. You'll find that Datamartist is much more affordable than complex, server side solutions. If you are equipping a small team, we offer volume discounts, and if your needs are for more than 15 licenses, we invite you to contact sales@datamartist.com to inquire regarding enterprise licenses. How do I get technical support for Datamartist? 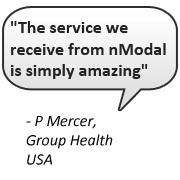 At nModal Solutions we take great pride in the speed at which we respond to our users. We know its one of the key advantages that you get when working with a small, dynamic software company, and our customers tell us what a refreshing change this is from the "Mega" software vendors. To get support any time, don't hesitate to email us at support@datamartist.com. If you want to talk to us during Toronto business hours (Eastern standard time), you can call 1 (888) 840-1538. When you purchase datamartist license, you get a free one year subscription to technical support and upgrades. After that you will be able to purchase additional years subscriptions as needed which are 20% of the versions price when you buy the maintenance subscription. You can use the version of Datamartist you purchased forever, you only need to purchase the maintenance subscription to continue to be entitled to upgrades and support. For more information about our support please read our help and support service page, or feel free to give us a call, the number again is 1 (888) 840-1538. Datamartist is developed by nModal Solutions Inc, a Toronto, Canada based company. nModal was incorporated in 2008, and has developed a powerful, visual data profiling and transformation framework. Datamartist is the flagship product based on this framework. Data profiling is a powerful technique that allows you to understand data quality issues and address them. What are the benefits of Data profiling? Understand your data quality in a quantifiable way. Reduce the cost of business intelligence and data migration projects through better budgeting and planning by knowing where issues lie BEFORE you hire the development team. Provide both a clear image of what needs to be fixed and how, and a method for validating the cleansing was successful. What are the benefits of Data profiling with Datamartist rather than custom SQL development? Datamartist provides a wide range of easy to use data profiling tasks. It would take significant time and SQL development to recreate an equivalent data profile, and without datamartists visual display and drill down capabilities the analysis of the results would be time consuming and error prone. This wasted effort would have to be repeated for each new project and table, as the SQL hard codes table names, column types etc. Datamartist provides a flexible, visual environment that can quickly look at data from multiple sources- both databases and files. To use data from flat files or spreadsheets in an SQL based profiling effort, database tables must first be created, and the data loaded in. While datamartist loads multiple data types in a single column from files and spreadsheets easily, databases will reject rows, and often the database development can be painfully tedious. How can Datamartist define complex data transformations without programming? By using blocks and connectors, very complex data transformations can be created a step at a time. Each block represents a type of transformation or operation that can be performed on the data. The blocks are configured using wizards and controls- no programming. But because literally hundreds of blocks can be connected together in any combination, and blocks can contain other blocks, letting the user organize data transformation canvases easily, the overall transform can be extremely complex and powerful. How much data can Datamartist handle? Datamartist can handle large data sets. It has a preview mode which allows the user to only load in a few tens or hundreds of thousands of rows while building the data transformation, then once everything is ready the user "runs with all data" and Datamartist does the entire calculation and writes the results out to files or tables defined by export blocks. Although it depends on how many blocks and how many calculation steps are used, data sets with even millions of rows can be processed. Because Datamartist provides the ability to use SQL queries at the input if desired, even larger tables can be queried and summarized, depending on the capabilities of the database platform. Do I need to install a database on my machine to use Datamartist? No. Datamartist installs everything you need in one simple install, that usually takes less than a minute. Datamartist can read and write information from databases, however- either those on your machine or remote ones. Do I need to reinstall when I decide to buy? No. Once you've decided to purchase, buy a license through the datamartist.com website, and a license key will be emailed to you. You do not have to uninstall the trial version, but we do recommend that you keep up to date- check if there is a newer version by comparing the version in "about" in the trial to the version on the datamartist.com download page. But either way, it will work, and you can download the updated version later if you like. Run Datamartist while connected to the internet, select help and then click on ACTIVATE. You will be prompted for your key, copy and paste it from the email you received and datamartist will be activated. Can I run Datamartist on multiple machines? You can remove licenses from machines, so as you upgrade your hardware, you'll always be able to remove from the old machine and activate on the new one. Where does Datamartist fit in my business intelligence architecture? Provide a less expensive, faster, more flexible method to transform data allowing a reduction in overall cost while increasing speed and quality of many types of data analysis. By providing a powerful, visual environment Datamartist lets project and IT resources to look into the data, understanding data issues and easily communicating them. In addition, because datamartist can automate data transformation and profiling tasks, it can be used to create a periodic snapshot of key data quality metrics, letting an organisation track and report on data quality. Enterprise BI, with extremely large software suites and systems which are costly and project based, with new functionality being delivered in time scales of months or even years. They can provide high quality results and manage very large data sets, but are often overkill, and are too expensive and slow to respond to day to day business needs for data. Spreadsheets and Shadow Systems, that are often created without the approval or knowledge of IT departments, which while providing very fast response usually measured in days or weeks, are often plagued with data quality or integration issues, and can result in a huge amount of duplication and data inconsistency. Datamartist is a "third way" that can be implemented to provide an alternative between these two extremes. It does not replace either completely, but by transferring tasks that are ill suited to either the enterprise systems, or to spreadsheets, Datamartist provides a right-sized capability that reduces cost, improves quality, and speeds up delivery of data. I've got a data problem- I'm just not sure I have the in house resources to handle it. nModal Solutions Inc. also provides consulting services. Both in support of projects based around the Datamartist tool, and in data transformation and analysis projects in general. Compare Datamartist functionality to spreadsheets and databases. Datamartist at the Financial Technology Show.